When I learned that Universal was renaming one of its streets after Stanley Wilson, I jumped at the opportunity to write about it — and composers John Williams, Lalo Schifrin, Quincy Jones and Dave Grusin all immediately agreed to talk with me about him. That’s because he helped launch all of their careers at Revue/Universal TV in the late 1950s and 1960s. 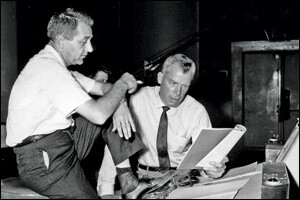 Stanley Wilson confers with “M Squad” star Lee Marvin. Wilson is an unsung hero in the film/TV music business. Anyone who grew up in the 1960s will remember seeing “Music Supervision… Stanley Wilson” at the end of practically every show that came out of Universal City. And sharp-eyed jazz fans will recall seeing his name as conductor or producer on albums by Benny Carter and Quincy Jones. He was a great man who deserves to be remembered. In 2001 I wrote a 52-page biography of him for The Film Music Society’s Cue Sheet (available here) and it’s still among my proudest accomplishments. This entry was posted in Composers, Film Music, From the Files, Interviews, Television Music and tagged Benny Carter, Dave Grusin, John Williams, Lalo Schifrin, Quincy Jones, Revue TV, Stanley Wilson, Universal TV, Variety on March 17, 2012 by Jon Burlingame.